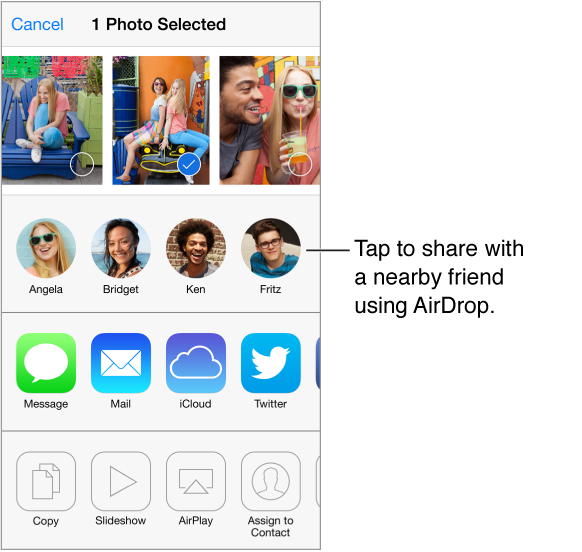 You can share photos and videos in email, text messages (MMS or iMessage), and tweets, and on Facebook and Flickr. Videos can be shared in email and text messages (MMS or iMessage), and on YouTube, Facebook, and Vimeo. You can also share photos and videos using Photo Sharing. See iCloud Photo Sharing. Share or copy a photo or video. View a photo or video, then tap . If you don’t see , tap the screen to show the controls. The size limit of attachments is determined by your service provider. iPhone may compress photo and video attachments, if necessary. You can also copy a photo or video, and then paste it into an email or text message (MMS or iMessage). Share or copy multiple photos and videos. While viewing by moment, tap Share. Save or share a photo or video you receive. Email: Tap to download it if necessary, then touch and hold the item to see sharing and other options. Text message: Tap the item in the conversation, then tap . Photos and videos that you receive in messages or save from a webpage are saved to your Camera Roll album.